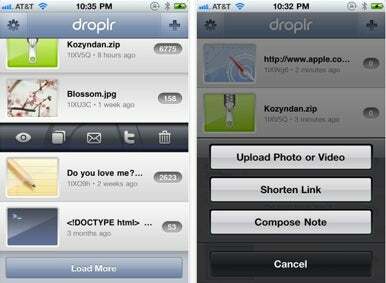 Droplr, Culturezoo’s dead-simple photo- and text-sharing service—which recently became a Mac Gem—now has an iPhone app. Droplr is designed to alleviate the frustration that can often arise when trying to share a file, a link, or even just some text. Lengthy links and attachments can get finicky when conveyed via e-mail, and Twitter only deals in short bits of plain text. Droplr’s Mac client lets you drag-and-drop anything you want to share online, then automatically copies a short URL to your clipboard for use in e-mail, Twitter, or anywhere else you need to share something. Now Droplr’s sharing convenience is on the iPhone. You can upload photos or videos, type something longer than Twitter’s 140-character limit, then share it anywhere online with a short Droplr URL. Existing users can manage their existing “drops,” and new users will be greeted by a handful of demo drops that offer an idea of how the service works. Droplr’s iPhone app also features thumbnails for images as well as icons that quickly identify other types of shared items. A couple of new features have been added to the Droplr service since our Gems writeup in August. First, my primary gripe with Droplr has been resolved, as you can now manage your drops by signing into the Droplr Website. Previously, if you regretted uploading a photo or forgot to edit out something personal, there was no way to remove that content from Droplr’s servers. While the sharing URL you receive is private unless you hand it out to people, it’s still nice to see real management features added to the service. The other new feature is the option of sharing your items with a custom domain. Instead of sharing your stuff at Droplr.com or the even more condensed drp.ly, you can purchase a “vanity domain” from a registrar and use it with Droplr. This means you can quickly share your stuff via Droplr, but from a domain that matches your business, blog, or other online venture. The Droplr service offers 1GB of storage space for free right now, though Culturezoo is working on adding paid accounts with more space and other options. You also need a Twitter account to register and sign-in, though that should also change soon. Droplr for iPhone costs $4 and is available now in the App Store, requiring an iPhone or iPod touch with iOS 3.0 or later.